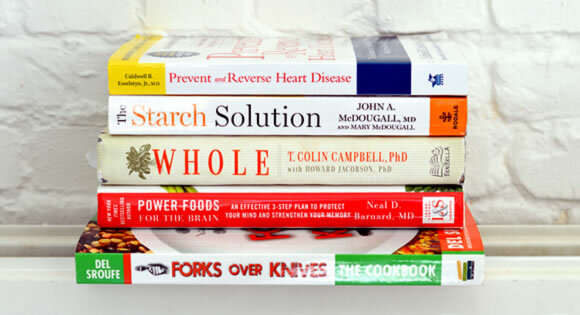 Plant Based Books – When embarking on a plant based diet it often helps to educate yourself as much as possible. There are many different schools of thought when it comes to plant based diets. Some peple believe eating a plant based diet high in fruit is the answer, others believe in focusing on vegetables, and some focus on starch. It can be confusing, but the truth is, whichever way of eating that works for you as long as it’s plant based will be something that makes you feel better and get healthier. The China Study – This book is by Thomas M. Campbell II is a book that gets most people started on the path of eating plant based. That is because The China Study is one of many studies that show how eating plant based is not only optimal for health for humans but it’s simple to do, and great for the environment too. If you want to know more about the politics behind why we have certain ideas about nutrition The China Study answers those questions clearly. You’ll be surprised and shocked at what you learn. Whole: Rethinking the Science of Nutrition – Another entry with T. Colin Campbell’s name on it, this book has Howard Jacobson who is also a health educator and ecological gardener as a contributor. You’ll learn more about the profit motive behind our current conventional wisdom regarding nutrition. Reading this will help you realize even more than eating plant based is the way toward health and that advice to the contrary is all about making more money and not about promoting health. Forks Over Knives: The Plant-Based Way to Health – Gene Stone, with forwards by T.Colin Campbell and Caldwell B. Esselstyn is the book version of the fascinating documentary of the same name. The book explains how a very simple change from the standard diet that is most known in the world to eating a whole food, plant based diet can make all the difference in your health. People have reversed heart disease and saved their own lives because of the idea of adding in more plants crowding out the unhealthy animal products and processed foods that most people consume today. My Beef with Meat: The Healthiest Argument for Eating a Plant-Strong Diet – Plus 140 New Engine 2 Recipes – This entry by Rip Esselstyn gives you more to go on including wonderful recipes to help you make the transition to eating a plant based whole foods diet easily. The book is funny, engaging, and a good read. You’ll salivate over the recipes and wonder why you didn’t think of this sooner. Getting to eat such wonderful food while also getting and staying healthy is a dream come true for most. This book will help you make it.